Procedure: Cut a small sample of textile fiber and holding it in a tweezer or forceps cautiously ignite with a matchstick or lighter. 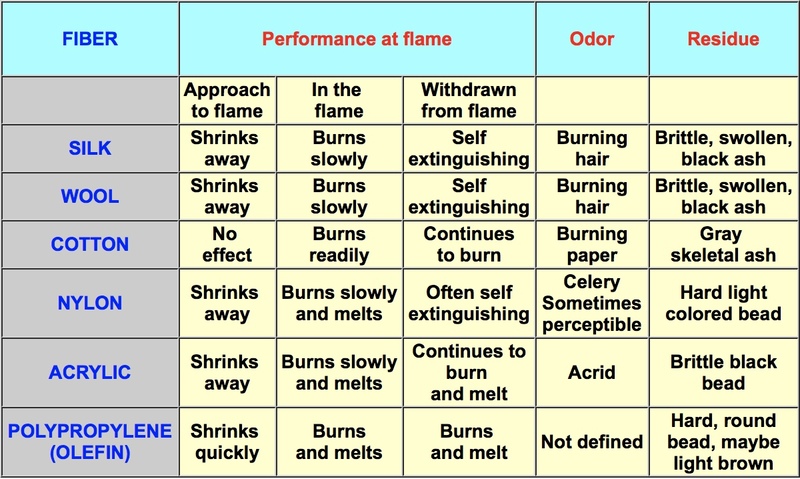 Observe the sample carefully, because each fiber type will burn in a specific way, producing different colored smake, a particular smell and leaving its own kind of residue. To match your findings with the correct fiber compare with the chart below. Some procedures may involve heat, and some some solvents are toxic and corrosive and flammable. Use extreme caution ! Polypropylene (olefin) soluble in m-xylene and cyclohexanone. Acrylic soluble in dimethyl formamide. Nylon 6 is soluble in dimethyl formamide and nylon 66 is not.